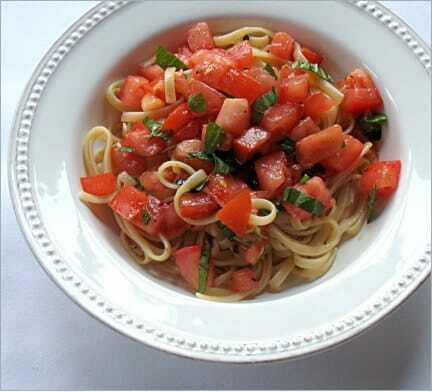 Light and delicious, this Homemade Tomato and Basil sauce Recipe is the perfect summer dish! Use it to top low calorie pasta or grilled chicken breasts for a tasty, weight watchers friendly meal. And with a 0 Points per serving, you can enjoy this Italian sauce recipe without worrying about using up too many Weight Watchers Points. It’s super easy to make and tastes wonderfully fresh! If you are looking for an easy, no-cook sauce recipe that the whole family will enjoy, this one will definitely take the cake. Enjoy! In a large glass mixing bowl, combine all ingredients; let stand at room temperature for 15 minutes. My tomatoes are in and this is delishious! This looks delicious and so easy! Will definitely try this one. Thanks for the recipe. With my tomatoes just starting to come ripe, I will put this to good use.